Waste sorting is the process by which waste is separated into different elements. Waste sorting can occur manually at the household and collected through curbside collection schemes, or automatically separated in materials recovery facilities or mechanical biological treatment systems. Hand sorting was the first method used in the history of waste sorting. Waste can also be sorted in a civic amenity site. "Waste segregation" means dividing waste into dry and wet. Dry waste includes wood and related products, metals and glass. Wet waste typically refers to organic waste usually generated by eating establishments and are heavy in weight due to dampness. 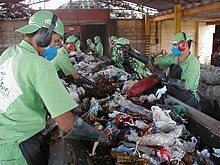 Waste can also be segregated on the basis of being biodegradable or non-biodegradable. Landfills are an increasingly pressing problem. Less and less land is available to deposit refuse, but the volume of waste is growing. As a result, segregating waste is not just of environmental importance, but also of economic concern. Leftover food which has had any contact with meat can be collected separately to prevent the spread of bacteria. Meat and bone can be retrieved by bodies responsible for animal waste. If other leftovers are sent, for example, to local farmers, they can be sterilised before being fed to the animals. Peels and scrapings from fruit and vegetables can be composted along with other degradable matter. Other waste can be included for composting, such as cut flowers, corks, coffee grounds, rotting fruit, tea bags, eggshells and nutshells, and paper towels. Chip pan oil (fryer oil), used fats, vegetable oil and the content of fat filters can be collected by companies able to re-use them. Local authority waste departments can provide relevant addresses. This can be achieved by providing recycling bins. In Germany, regulations exist that provide mandatory quotas for the waste sorting of packaging waste and recyclable materials such as glass bottles. In Denpasar, Bali, Indonesia, a pilot project using an automated collecting machine of plastic bottles or aluminium cans with voucher reward has been implemented in a market. which causes it to stink. ^ Aluminum Recycling, Second Edition - Mark E. Schlesinger. pp. 75-76. ^ Germany, Garbage and the Green Dot: Challenging a Throwaway Society - Bette K. Fishbein. pp. 16-17. This page was last edited on 24 April 2019, at 13:33 (UTC).